Download the April – June class schedule. 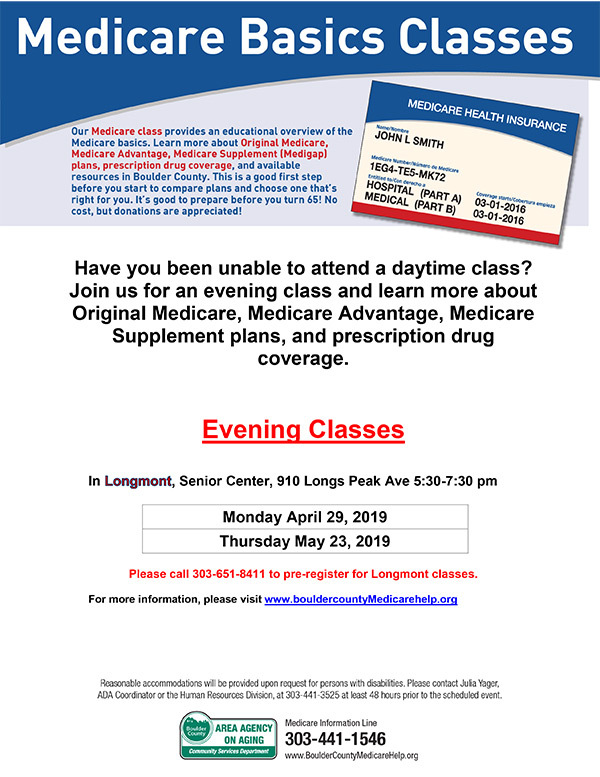 Download the class schedule for Longmont evening class in April and May. Our program provides up-to-date, objective information and guidance when comparing and enrolling in Prescription Drug plans (Medicare Part D), Advantage Plans, and information about Supplemental insurance plans (Medigaps). We also provide guidance in the appeal process and information about resources for financial help with Medicare Costs. That the Health Insurance Marketplace is not for people with Medicare? If you have Medicare nothing will change and you will receive the same health care benefits you have had in the past. The shingles vaccine is covered under Medicare Part D (prescription drug plan)? If you are enrolled in a Part D plan either as an addition to Original Medicare A and B, or as part of a Medicare Advantage/Health plan (like an HMO, PPO or PFFS plan), you will need to call the customer service number on the back of your prescription drug card to find out what your co-payment for the vaccine will be. Medicare does not generally pay for long-term care, routine dental or eye care, dentures, cosmetic surgery acupuncture, hearing aids and exams for fitting them, as well as routine foot care. 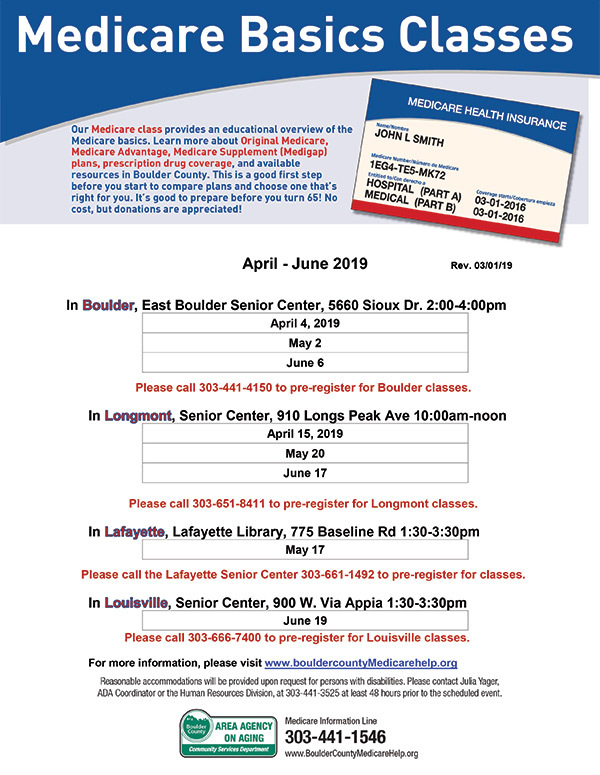 Boulder County Department of Housing and Human Services can help answer questions about Medicare premium and deductible help for beneficiaries who qualify? For more information call 303-441-1000.